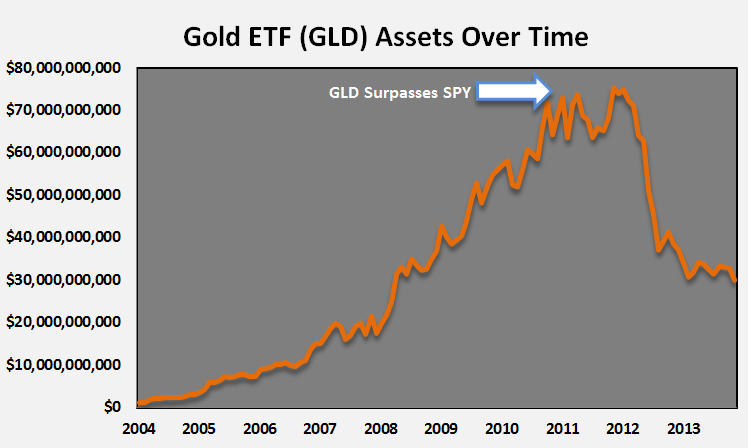 In August of 2011, the Gold ETF (GLD) surpassed the S&P 500 SPDR ETF (SPY) as the largest exchange-traded fund in terms of assets. Since then, the investment performance of these two funds tells how out of control things got for gold, as the SPY is up almost 60% while GLD is down nearly 25%. It appears that the fair-weather gold investors have been shaken out, and then some, in the latest drawdown. Although the fund’s performance is down by a quarter, the total assets invested in GLD are down by 60%. After gold was up big in the 2000s, many financial advisors and consultants started advocating for a 5-10% portfolio allocation to gold because, well, chasing performance makes for an easy sale. GLD was the obvious vehicle to use to express this new found love of gold. If these numbers are any indication, I doubt many of these placeholder allocations exist anymore. As GLD’s assets now sit in the $30 billion range, SPY’s total asset are now up to almost $170 billion, so they have more than doubled since the summer of 2011, which is pretty impressive. Investors are constantly trying to assign a reason to the market’s moves and I’m sure there are many legitimate narratives for gold’s fall and the S&P 500’s rise. However, the simplest explanation is usually the correct one, and in this case, it’s mean reversion. Gold couldn’t rise in a straight line forever (although some would have you believe it will) and U.S. stocks weren’t going to crash forever either. Mean reversion is conceptually simple to grasp, but harder to figure out in real-time as the mean for most markets and valuation levels is probably a moving target and the timing of the reversion is always subject to change. But if you understood nothing more than the fact that the markets and the economy move in cycles you would be far ahead of the majority of investors.